Iced tea, lovingly nicknamed the "Table Wine of the South," is the quintessential southern beverage, enjoyed by North Carolinians and other southerners year-round and served in virtually every restaurant and home as well as at all social events. In North Carolina, those ordering iced tea at a restaurant will usually receive "sweet tea," an extremely sugary version of the beverage, unless they specifically request unsweetened tea. 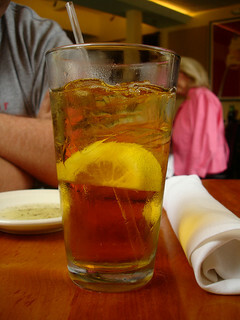 Iced tea in northern states is almost always served unsweetened. Tea was cultivated in China more than 2,000 years ago, spreading to Japan in about A.D. 800 and shortly thereafter to the West by way of the Persian caravans. Tea arrived in England about 1653 and quickly became the national drink in place of ale. It was the drink of the nobility, which assured its popularity. The East India Company began importing it directly from China by 1689 and held a monopoly on the tea trade from 1721 until 1833. In 1670 English colonists in Boston began drinking tea, although it was not sold to the public until about 1690. It became a trade commodity between the colonies and England by 1720. A mass meeting in Edenton on 22 Aug. 1774 was held in protest of taxes imposed on tea by the Boston Port Act. Following this meeting, a group of ladies from Edenton joined the protests, and their "Edenton Tea Party" of 25 Oct. 1774 led to a declaration of unity against using British imports, including tea. Following the American Revolution in 1789, America began trading directly with China, and the drinking of tea in America resumed. Tea began to be grown in Charleston, S.C.; this remains the only tea grown in the United States. Most tea continues to be imported from Asia and India. The introduction of iced tea in the United States followed the St. Louis World's Fair in 1904, at which it was first served during a heat wave. Following World War II, iced tea became a culinary fixture in the South. Many native North Carolinians recall the childhood task of breaking up the block of ice from the ice box to cool their summer tea. Hugh T. Lefler, ed., North Carolina History Told by Contemporaries (3rd ed., 1956). Jill Norman and Gwen Edmonds, Teas and Tisanes: Everyday and Unusual Teas and Tisanes and Dishes Flavored with Them (1989). Tyree, Marion Cabell, editor. "Iced Tea" in Houskeeping in Old Virginia. Louisville, Ky.: John P. Morton & Co. 1878. p.64. http://archive.org/stream/housekeepinginol01tyre#page/64/mode/2up. (accessed June 28, 2012). Tomlinson, Tommy. "Sweet Tea" Our State. August, 2010. http://www.ourstate.com/southern-roots-sweet-tea/ (accessed June 28, 2012). Klineman, Jeffrey. "I Wish I Lived in a Land of Lipton … What makes Southern sweet tea so special?" Slate.com. August 8, 2007. http://www.slate.com/articles/life/drink/2007/08/i_wish_i_lived_in_a_land_of_lipton_.single.html (accessed June 28, 2012). Glock, Allison. "Sweet Tea: A Love Story." Garden & Gun. July/August 2008. http://gardenandgun.com/article/sweet-tea (accessed June 28, 2012). "sweatea" September 13, 2007. Raleigh, N.C. Photo by Flickr user bunchofpants. http://www.flickr.com/photos/bunchofpants/1379881365/ (accessed June 28, 2012).